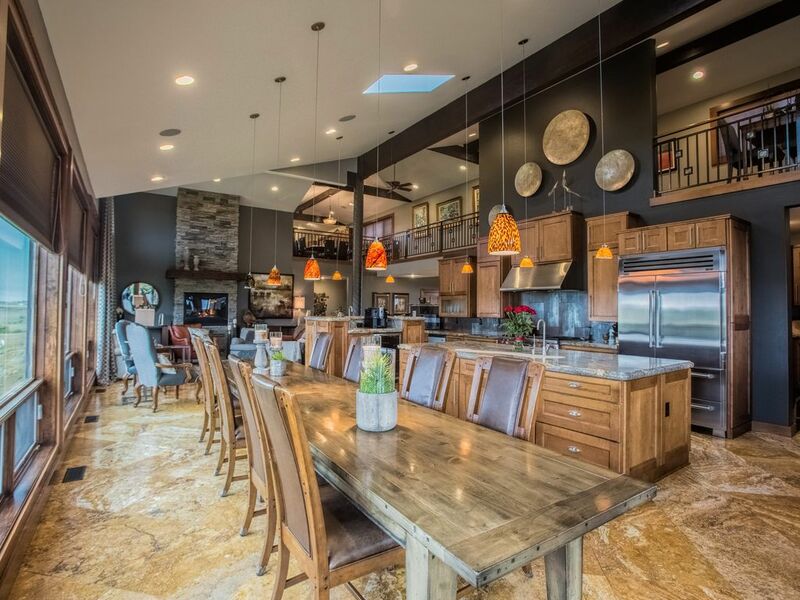 Relax in our 8,000 sq ft home located just 6 miles outside of Sturgis. Our kitchen and living room views overlook the beautiful black hills and our dining room table seats 14. We are located off of Hwy 79 (only 3 miles of gravel) on a 1 mile private road that makes getting to rally events very convenient. Master Bedroom has a private deck and hot tub, with private bathroom, and double headed spacious shower/ massage steam room. A private guest suite includes a den and full bathroom. These rooms are on the main level with no steps. The walk-out basement was just fully remodeled and has 10' ceilings. Four bedrooms have convenient sinks/mirrors in the rooms. Laundry facilities are located in the master bathroom and in the lower level. An 8-10 person hot tub is located on our back patio that has amazing views of the hills and stars at night... a perfect way to end the day! My husband and I have 4 children, ages 18-24. He is a local dentist and I am his helpmate at home and in our businesses. We are active in our local church and community. We love to travel and do triathlons together as a family. Working during the Sturgis Rally (August) is difficult for my husband, so we like to travel during this time. We also take vacations the weeks of Thanksgiving, Christmas, Easter Break, and 4th of July to spend with extended family. Our home is available during any of these times. Guests enjoy quiet, peaceful evenings on our patio with amazing views of the Black Hills, and beautiful sunsets. Gathering to talk or play music around the firepit and share the 8 person hot tub are popular activities. Our mornings are blessed with beautiful sunrises over Bear Butte that can be watched from the front patio and guest suite. We are 3/4 mile from our nearest neighbor and love our privacy. We have great entertainment space and enjoy having friends and family as often as possible. Includes an amazing massage chair that makes you want to stay longer! The home was fantastic and perfect for our family Christmas reunion. We couldn’t be happier! Kristen was unbelievable — hosting from another continent! Everything about the home and the gathering in it was just as we hoped — particularly when they cued the snow for a white Christmas evening!! Great Get-Away for the Entire Family! Our group ranged in age from 4-72 and everyone had a great time. The kitchen was a wonderful gathering area large enough to accommodate us all. The views of the property were very picturesque. The kids loved the ziplines, the hot tub, and all enjoyed sitting by the firepit at night, roasting marshmallows, and singing. The boys spent much time downstairs either in the movie room or game room, younger men used the exercise room, and almost everyone spent a little time in the massage chair. The owners were fabulous and tended to our every need. Each year we take the family to experience a new part of the US. This certainly left a great impression for all of us as we experienced South Dakota for the first time. We highly recommend it! This was an amazing stay! The owners treated us like family. They graciously welcomed us into their home. The views from the home are breathtaking, but what made this a memorable stay was the kindness we were shown by the owners, truly remarkable people! And yes, the home was beautiful too. Most spectacular views of mountains and sky ever! All from a house that matches in size & comfort!! "Great vacation! The house was beautiful and plenty of room for all of us!" "The house was very comfortable, with amazing views while the owners went out of their way to make sure we had everthing we needed. Game nights, star gazing, the huge hot tub & gas fire pit were so much fun! Made a large family vacation so relaxing!" "This vacation was awesome! The house had beautiful views and enough space to fit everyone comfortably. The owners (TJ and Kristen) were welcoming & helpful to us." "Who would have thought South Dakota could be so beautiful! TJ and Kristen gladly opened their house to our family of seventeen - and we had more than enough room. The floor to ceiling windows framed the sunsets perfectly and the back patio was great for evening fires and s'mores. Our experience in Whitewood was unforgettable! Thank you!" "The house was terrific, with incredible veiws and a spacious floor space. It never felt crowded even with a seventeen person group. TJ provided us with a few surprises to enjoy and play with and I am grateful for his hospitality." "This vacation was unlike an other. The views from the house are majestic. Fun activities from the game nights, trampoline to just hanging on the patio and having a fire with everyone." Kristen did recommend a local couple (Markee & Travis) to have a couple meals cooked for us, along with massages available to the group. Travis is an amazing cook. He prepared meals for the entire group that were just fabulous! Prime rib that melted in our mouths, ribs, sliders that convert a vegetarian... - all just incredible. Markee came onsite in the mornings to start our days with incredible massages. After long days of hiking the national parks & attractions - she had just the perfect touch that kept the group feeling great! We would highly recommend having them for your group. It just made the trip so much more relaxing & enjoyable! The location is pretty remote. It was amazing to sit out in the evening and listening to absolute silence (unless we were all talking). Coming from Boston, New York, & Philly - that was a nice change for a week. Still, it was easy driving to Windcave & Badlands National Parks; Jewel Cave; Mt. Rushmore; Devils Tower; Sturgis; Deadwood; and much more. The only "problem" is deciding to spend your time inside or outside! We had s family reunion there and had an excellent time. The house and property was in great shape and there was nothing that we needed that was not available for preparing meals and relaxing with a variety of activities available. I would certainly recommend this venue for your family get together. It's right outside of Sturgis and offers a great opportunity to do all that's available in the Black Hills. Our family had a reunion at this home August 20-August 24, 2014. We had 21 adults and 10 children (ages 13 to 2 years). We all had a ton of room, plenty of beds and enjoyed the amazing views. Our children had the opportunity to “swim” in the hot-tub, and TJ came over and assisted with letting the kids’ zip-line. We appreciated the time he and Kristen (Home-owners) put into answering all of our questions and accommodating a large group. The house was cozy, comfortable and did I mention the views??  The deck has an incredible view of the hills and you just felt at peace while at this home. With having the kids there, we did a lot of the site-seeing that you would expect (Watiki Water Park, Reptile Gardens, Bear Country USA, Mount Rushmore, etc.) and the drive back and forth was quick (about 35 minutes to Rapid City) so the property isn’t too far out. I would definitely recommend this home to any family and larger group gathering! Thank You for sharing your home with all of us! local community center has pool, basket ball, etc. Ski area is 30 minutes away... view slopes from our home. Rates are subject to change until $1000 deposit is received.